My number one traveling companion is Matilda. She goes on the majority of my trips with me. She even came alongside me for three months as I journeyed across Mediterranean Europe in 2015. She’s been a trusty sidekick. And she would have plenty of stories to tell, if only she could speak. As you may have guessed, Matilda isn’t a human. In fact, she’s not living at all. She’s my luggage-style backpack, affectionately named after the Australian song “Waltzing Matilda”. But on my most recent trip, I decided to give Matilda a break and take a minimalista packing challenge. 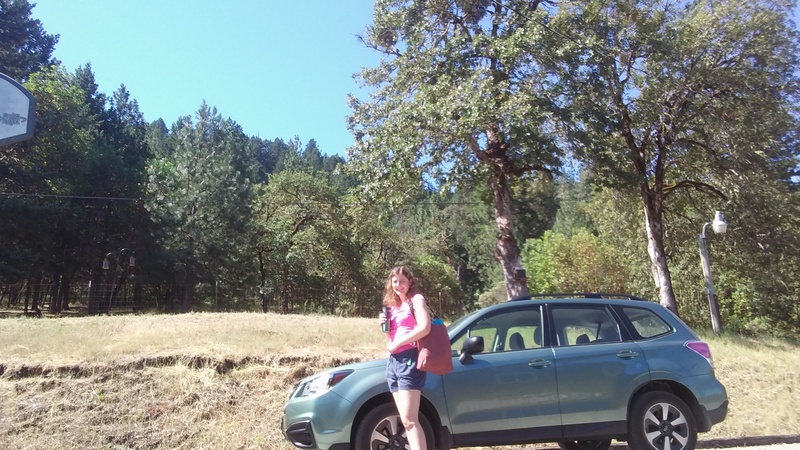 On Saturday morning, I decided to take a weekend trip up to Eugene and then down the coast, planning to not return home until Monday. Since sunny Eugene and the windy coast offered two different environments, packing clothes served as a challenge. I was also on limited time since I was leaving just a couple hours after booking my hostel. Another challenge was that I would be at work on Monday before returning home, so what I wore had to be appropriate for that. Everything I took easily fit in one grocery bag. -My purse (Lewis N Clark) with the usual items: ID, credit cards, phone, writing implements, glasses, a book, etc. -A small packing tube (Lewis N Clark) with all the clothes save for the sandals, shorts, and tee I was currently wearing. I wasn’t sure if a jacket could fit in with everything else, but it ended up working. 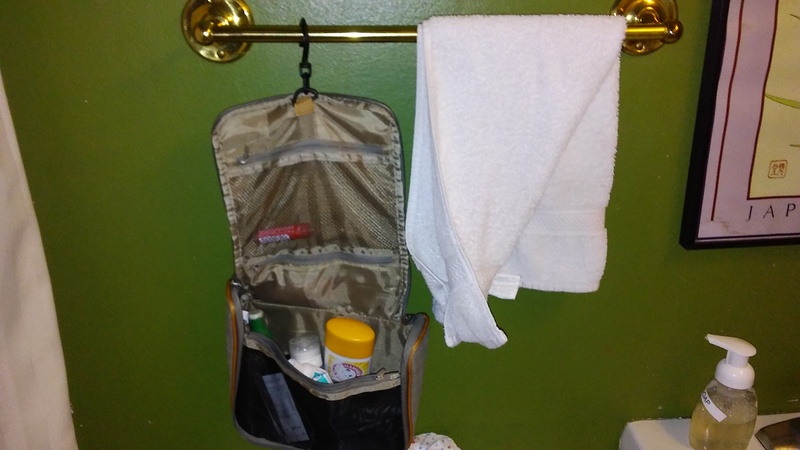 -A relatively empty toiletry kit (Lewis N Clark) with toothbrush, toothpaste, hairbrush, shampoo, and other essentials. Everything except the deodorant was small or travel sized. -Food. I planned to eat out for one meal, and the hostel provided breakfast, but I had to make sure I had enough for other meals and snacks. I also brought a travel mug and CamelBack for water. -A handful of CDs and audio books on disc, because I prefer those to digital for no reason in particular. Since this was a road trip, I also had my new car. However, I chose to prove that I was packing light and wasn’t “cheating” by using stuff that is normally kept in my car. For example, I normally keep a folding camping chair in my trunk. 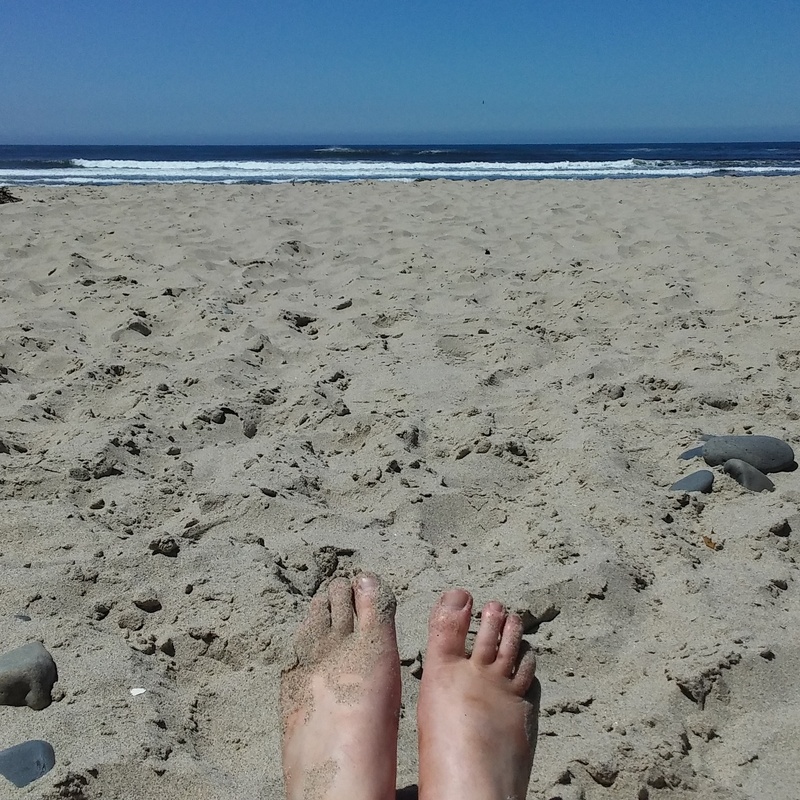 It may have been useful while eating lunch on the beach, but I sat on the sand instead since I could not fit that chair in my grocery bag. Another sort of “exception” was that I could utilize things included at my hostel. I used their required bedding, ate their free food, and even used their free art supplies to make some drawings. However, these drawings were still required to fit in my purse in order to leave with me. Wool socks- Even though it would be a fashion faux pas, my walking sandals started to smell after the first day from several miles of walking in the heat. And yet I had to wear the stinky sandals tbe next day because that was all I brought. Essential oil or something else scented- For same reason as above. Flip flops- Not only would these provide another footwear option, but they woild be nice to wear around the hostel and in the bathroom. I normally pack flip flops; I just decided to see what it is like without this time. Never again! The book- If I for some reason ran out of reading material on my phone, the hostel had shelves filled with books. And I was having too much fun walking around and seeing the sights anyway. Some toiletries- Much of what I packed in the toiletry kit were “just in case” items that I would rely on if the need arose, but those situations never came up. I would still pack them for future trips, though. A lot of food- I didn’t really expect to consume half a loaf of bread and half a jar of peanut butter, but I didn’t feel like repackaging it before leaving. Oddly enough, I used up my big bag of snack mix, but only because I donated it to the hostel’s potluck. The pack part of the CamelBack- I just took the water reservoir out and put it inside my purse to walk around town. Cards- I used my credit card to pay for everything, my Kroger card to get discounted gas, and I legally had to have my driver’s license. That’s all I used, but I still had a dozen various gift cards, store cards, and other plastic in my purse. Overall, I think it was very easy to live out of a grocery bag for the weekend. With some modifications and switching out of items, I think I could go a week or even longer with the same amount. What about you? How have you packed lightly? Let me know in the comments! 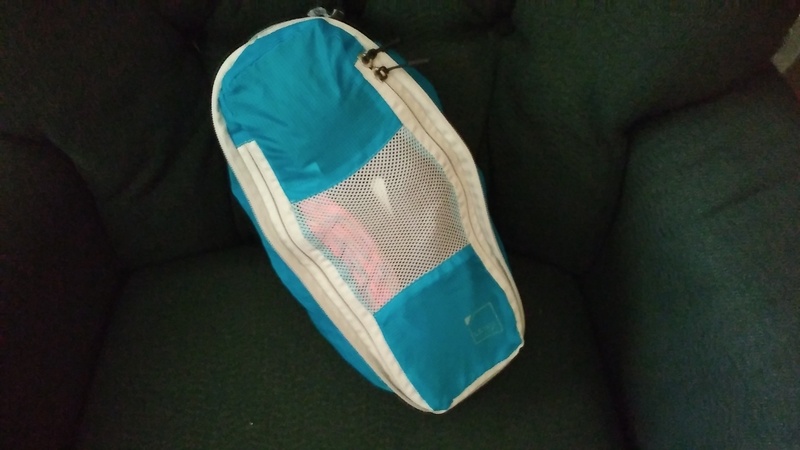 Previous postMy Favorite Piece of Travel Gear… GONE! Packing light can be a challenge sometimes, but it’s so worth it. Even when I pack minimalistic, I still tend to have one or two pieces I didn’t need. Light luggage definitely makes moving around easier. I love the idea of naming your luggage. I now have to come up with names for my backpack and duffel. Great advice on packing light. I always bring more books than I need. Let me know what names you come up with! 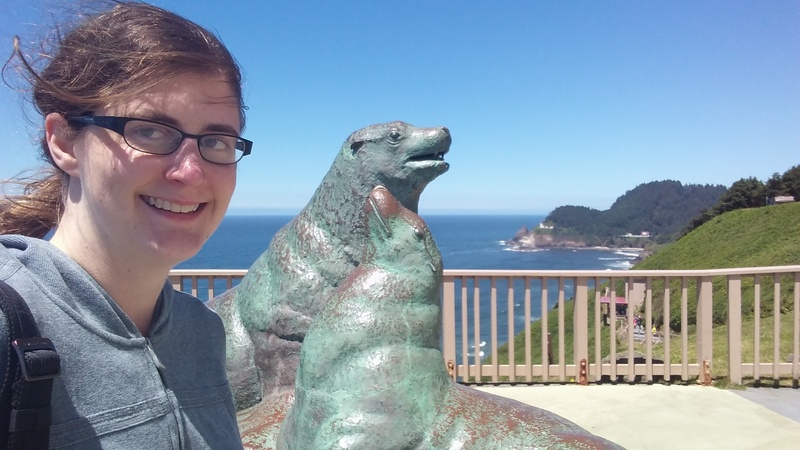 Awesome travel tips and tricks for a short trip, Jessica! Do you always buy a travel sized toiletry kit? Hope you found this useful, Agness. I got the Lewis N Clark toiletry kit earlier this year, which I love and have taken with me on several overnights. It works a lot better than makeup bags and ziplock bags I’ve used in the past! I fill it up with my own toiletries, though. If a product comes in too big of container, I’ll put it in a GoToob, GoTubb, or another small bottle. Even the deodorant isn’t in its original container- I’ve been filling the same stick of deodorant with my homemade recipe for years now!